Sar Planina (Šar Planina, Shar Planina), is situated in the north-western part of the Republic of Macedonia, above the productive Polog valley. It expands in beyond one's sight and the snow cap on it during the early autumn, winter and early spring switches with the sheep folds in the rest of the year. 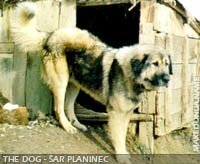 The well known Macedonian shepherd dog, Šarplaninec, finds Sar Planina to be it's home. The Russian consul Jastrebov describes the area in the 19th century, as a wonderful place to stay, under which is the city of Tetovo. He said exactly as he was told previously by the Turkish Pashas and Beys, who already had built their Harem's on the mountain. What attracted the Turks to built their Harem's in the small city of Tetovo. The answer to that is - Tetovo is in the foothills of the Sar Planina, which provides the fresh air in the city. 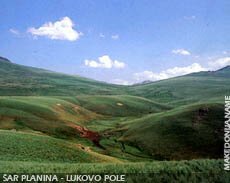 Sar Mountain look like a huge sea of grass and is the largest compact area covered with pastures in Europe - "Lukovo Pole". Macedonia is a country of lakes and mountains, and Sar Planina is the most dominant with it's massifs. Sar Planina is wild and tame. Sar Planina is covered with snow, from November to April. 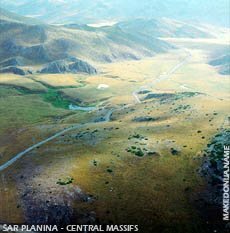 Sar Planina width is 12 km, and length of 80 km. The highest of all peaks is Titov Vrv (2,747 meters above the sea level), while other higher peaks are Ljuboten (2,499m. ), Bistrica (2,640m.)... Ljuboten is even a part from the coat of arm of Skopje (can be seen even from Skopje). There are 39 glacial lakes on the Sar Mountain, of which 27 belongs to Macedonia. Of those 27, 8 are temporary and 19 are always filled with water. As largest and most important are: Bogovinsko, Crno, Belo, Golem Gjol, Mal Gjol, Krivošinsko lake, Golemo Dedelbeško, Malo Dedelbeško, Gorno Dobroško and Dolno Dobroško. The Bogovinsko lake is the biggest one and covers an area of 67,000 sq meters. It's depth is 2,2 meters and length 452 meters and width 225 meters. It is located of 1,960 meters above the sea level. The Sar Planina, has always been populated densely, due to it's natural beauties. The cattle-breeding is the most important way for living. Almost all the villages on the Šar Planina, have a tradition of it, like Brvenica, Lešok, Vratnica, Tearce, Varvara, Odri, Dobrošte, Staro Selo, Rogačevo, Slatina, Glogji, Pršovce, Belovište and others. One of the most beatuiful ski-resorts in Macedonia, is situated on Sar Planina. That is Popova Sapka on 1,900 meters above the sea level. Sar Planina is filled with natural monuments and as well as cultural-historical monuments.